Spring is my favorite time of the year. Sometimes it seems as if winter can drag on and on, but then spring comes along and breathes new life into everything! The Easter season is such a fun time to gather as a family and celebrate the relationships we share. With so much focus on the family, it is a great time to find something fun to do together! We love to find any excuse to make a big deal out of our favorite things, and one of our favorite things is family movie night! We don’t mess around when it comes to family movie night. I received samples and compensation for this post, all ideas and views are my own. Affiliate links are used in this post. We love to cuddle up with our favorite movies, eat treats, laugh, and snuggle up as a family. When my oldest was a toddler he was obsessed with the movie RIO or “Fly Bird” as he called it. The colorful birds, the great music, and hilarious jokes, our whole family has been hooked for years! We decided that RIO would be our feature film this week and decided to have some pretty outrageous fun in the process. First up, a craft project. Some of our favorite scenes from the movie are when Blu and Jewel are in Rio for Carnival. The costumes and floats are so colorful and extravagant, my kids wanted to make their own disguise for the night. In what always ends up being some of my favorite projects, I opened up the art bin and let them have total control. We had a few foam masks to start with, and I also cut some from cardstock when my son requested a different style. 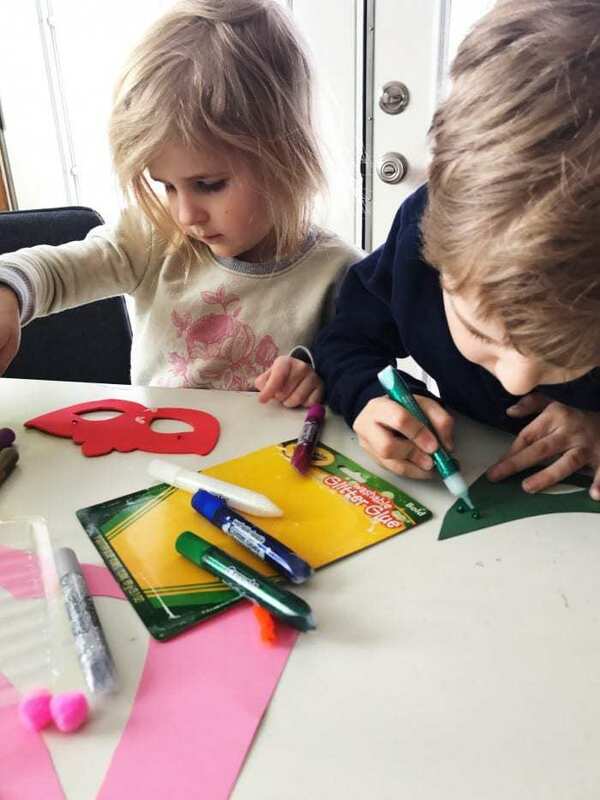 They gathered supplies and glitter glue and began their creative work. It happened to be nap time for my youngest, so I may have stepped in to create hers. After they were done gluing and everything had dried, I added a paper straw with hot glue as a handle on one side of the mask. 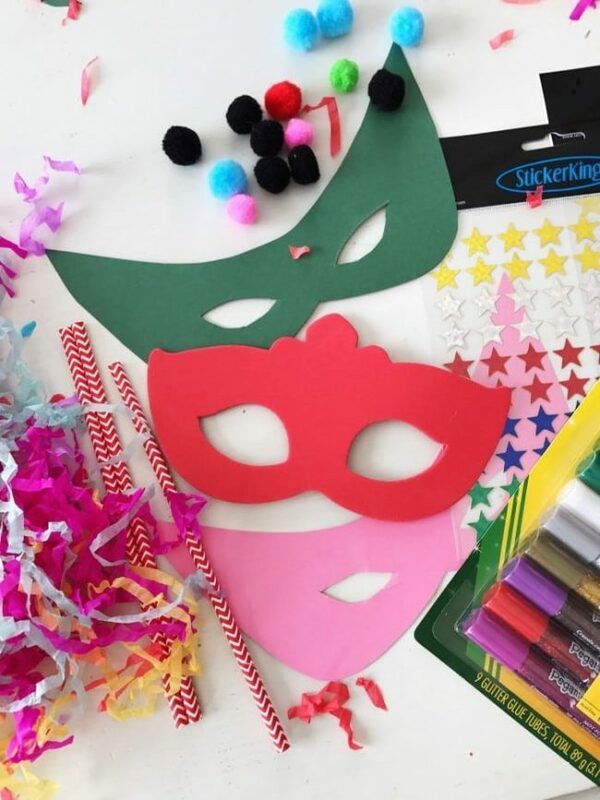 You could use a popsicle stick or even ribbon to tie their masks on with. When the Carnival scenes played on the screen, my kids grabbed their masks and started dancing and singing along. So fun! With their masks prepared we were ready to start the tastiest part of movie night, the treats! We love to create new munchies and desserts for our time together. 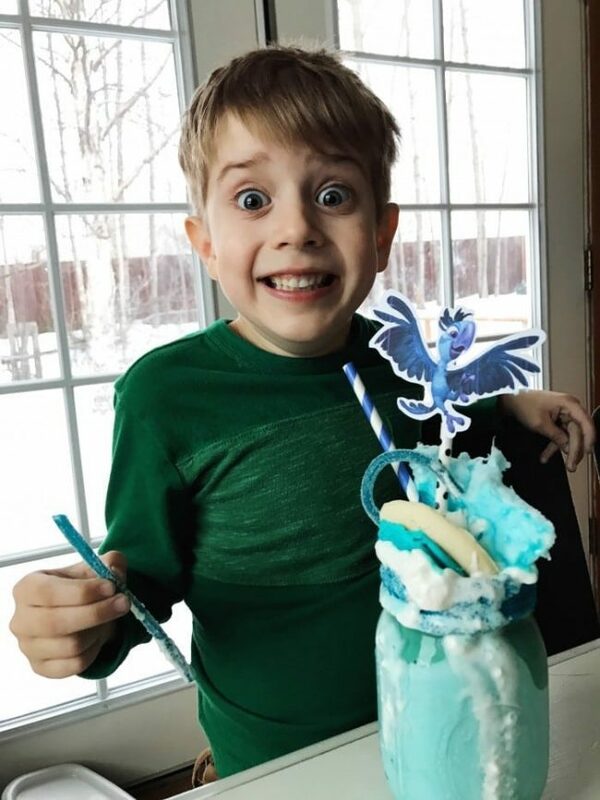 My kids have been dying to try making these extreme, crazy milkshakes that are all over the place now. RIO’s hero and nemesis seemed like the perfect characters to take our shakes over the top. Start by melting white chocolate in a bowl. 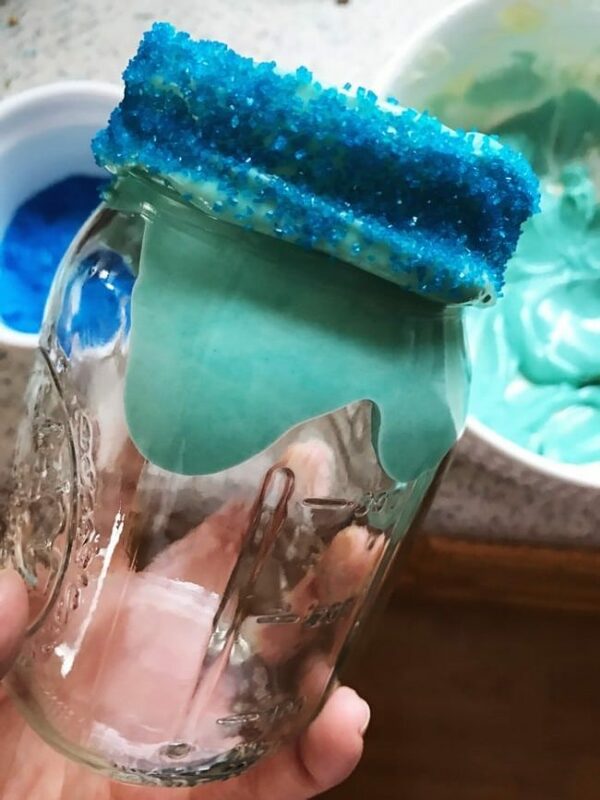 Separate and mix blue food coloring into one bowl. Coat the rims of your glasses. A thin, even coat works best. Add toppings. Coconut for white. Sprinkles for blue. In my blue glasses I let some of the chocolate coat the inside of the glass, just for fun! 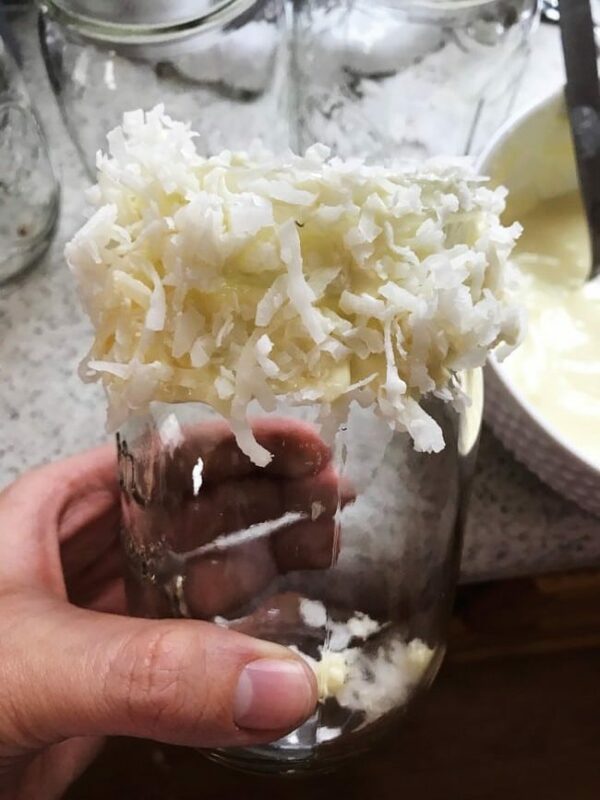 Let those glasses chill in the fridge until you are ready to fill. Mix milk, ice cream, and flavoring (if needed) together in a blender. Add more milk if your mixture is too thick. Fill your glasses with your shakes. Now the fun part! Gather all the toppings you can find and stack them up! 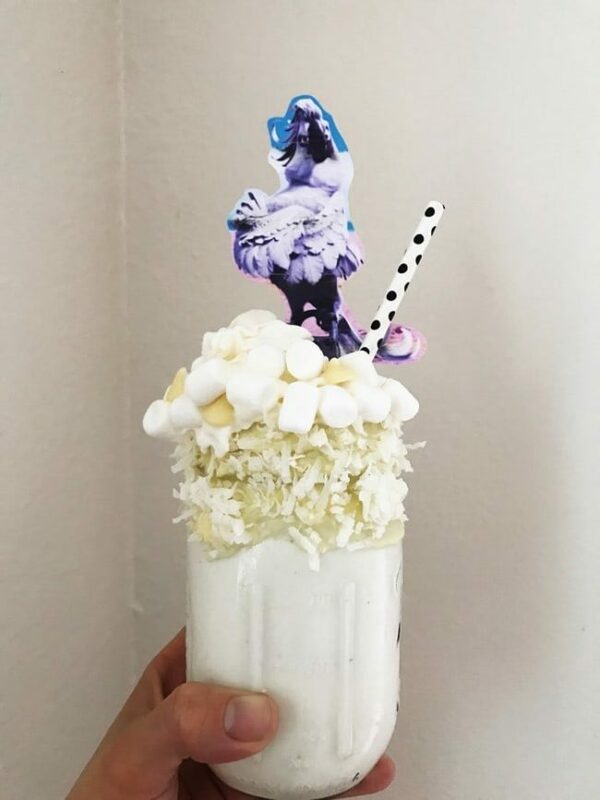 We even topped a straw with our favorite characters and added it as our final topping. A good layer of whip cream helps everything stay put, but only for so long so be ready to dig in! A few drops of food coloring for blue color. Topping suggestions- whip cream, sprinkles, rock candy, sour punch straws, sugar cookies (cut in half), cotton candy. Topping suggestions- whip cream, white chocolate chips, sprinkles, white chocolate chips, marshmallows. Nothing beats having treats, a great movie, and my family all together and having fun. RIO is the perfect family-friendly film that everyone will want to watch together on Easter. Download it now for easy access of any device you choose to use for viewing. What family night movie traditions do you have? Wonderful craft idea and delicious milkshake. Kids will love it. Oh yeah! 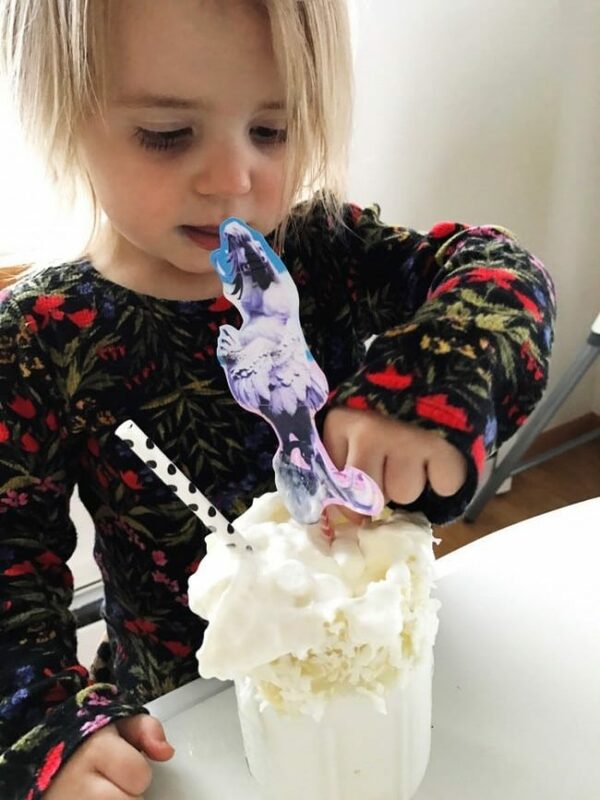 I love the mask craft idea to do with my kids and that milkshake looks awesome! I want to visit you. You make great drinks. Your Rio movie theme drink recipes look so beautiful, fun and delicious. And the presentation in Mason jars just adds to their photogenic appeal. I think I’m going to try making your Blu drink this weekend. Very creative and fun. The milkshakes look delicious. It looks like the kids really enjoy making their masks. I am sure my daughter would love to try those milkshakes. 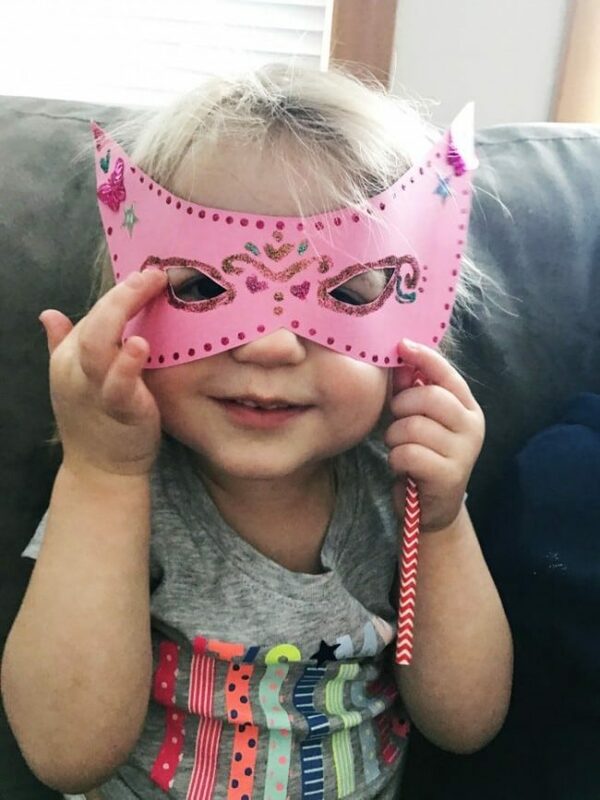 Masks are always a hit with the kids. They have fun making them and covering them in glitter. 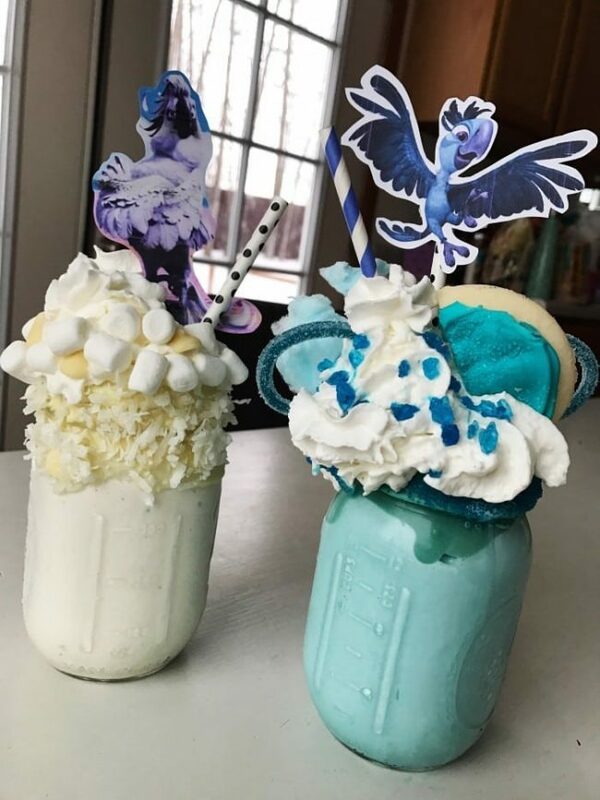 These milkshakes looks so delicious. 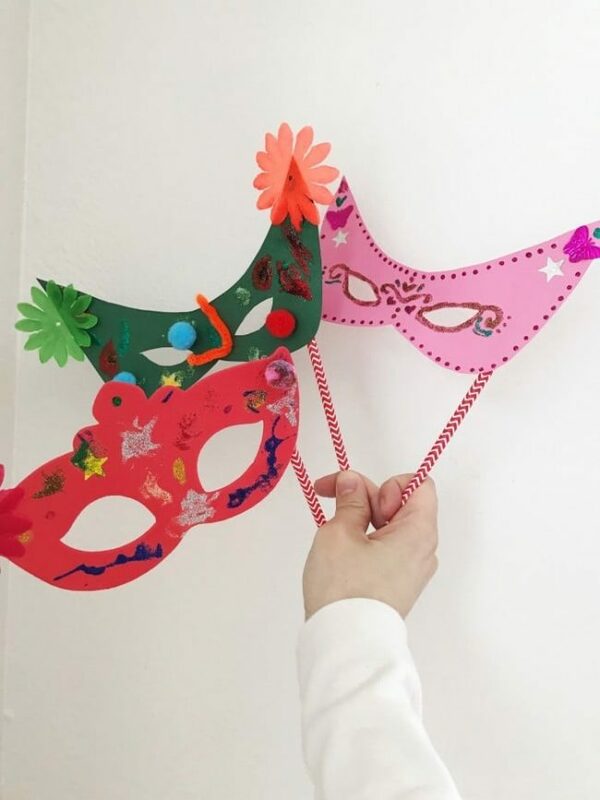 What a fun idea to make masks. Those milkshakes are over the top and look delicious. I’m sure the kids enjoy them. Oh, I love Rio! Mostly because of Bruno Mars (I have a bit of a crush) and these milkshakes are the perfect addition to a family movie night. WOW! Sign me up for this snack and craft! Both look fantastic! Yummy! I love a pretty drink! 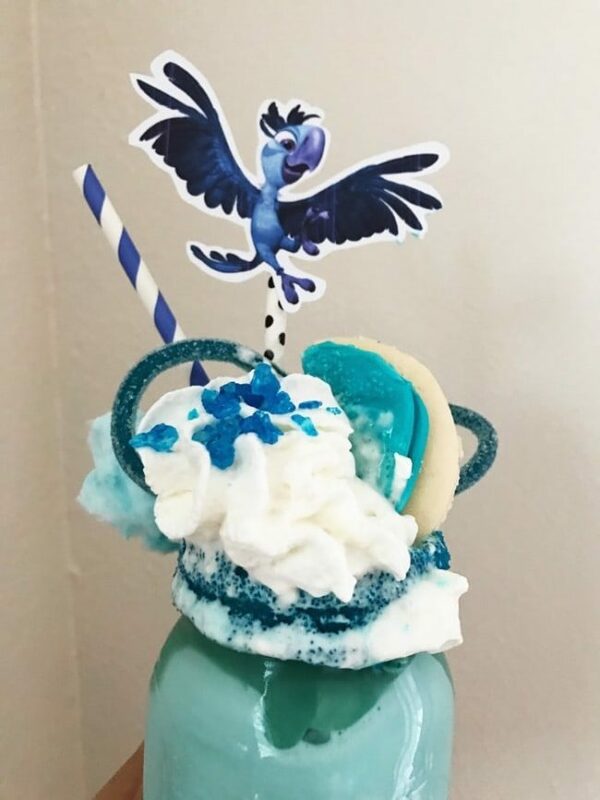 This looks wicked delicious and perfect for a dessert drink. This is a recipe for a very fun night! My kids love Rio so I am sure they would love this craft and treat. I know my kid I would absolutely love those shakes! Both of them looks so delicious I wish I could just take it right off of the screen. I love how creative you are with those masks to. Your kiddos look like they loved them! Oh decorating those masks must be so fun! I’m craving one of those milkshakes now. They’re so impressive with those Rio characters. Those look so good! I love those super cute toppers. Great ideas. Oh my goodness…..those look so good and fun to make! We usually just to pizza and popcorn for movie night. I have to give those a try! These milkshakes are awesome according to the weather and I like this simple method to make Rio mask. Really nice post.